Understanding growth stages can help to use production practices more timely and efficiently to obtain higher yields. This applies to planting, in-season diagnosis, herbicide, fertilizer, fungicide, insecticide, and harvesting. 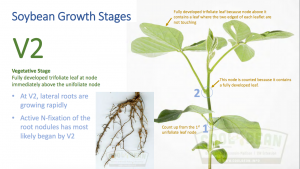 Click here to see the new publication: Understanding Soybean Growth and Development: How to Properly Growth Stage Soybean. It aides to help interpret what you are seeing in the field.